UNITED NATIONS, Oct 23 2017 (IPS) - As the crisis in Myanmar reaches unprecedented levels, frustration is at its peak as the international community remains slow to respond and act cohesively. Over 600,000 Rohingya refugees have crossed into Bangladesh since the renewal of violence on August 25, making it the fastest-growing refugee emergency in the world. The UN warns that up to one million—representing the entire Muslim population of Rakhine state—could flee to the neighboring nation by the end of the year if the crisis continues. Rohingya refugees have provided the outside world with glimpses of their horrific experiences, from villages being burned and attacked to women being raped by Burmese soldiers. The High Commissioner for Human Rights Zeid Ra’ad al-Hussein has called the government’s campaign against the minority a “textbook example of ethnic cleansing” while others have said that the violations may amount to crimes against humanity. Those that are able to reach Bangladesh often arrive to no food or shelter and are at risk of disease outbreaks as the resource-strained South Asian nation struggles to cope with the influx. Despite the evidence for the scale of violence and suffering, the UN Human Rights Council (UNHRC) has largely remained silent on the crisis while divisions in Security Council (UNSC) have prevented decisive progress towards any measure. With no end in sight, IPS spoke to the Special Rapporteur on Unilateral Coercive Measures and the Executive Director of the Geneva Centre for Human Rights Advancement and Global Dialogue Idriss Jazairy about the crisis in Myanmar, as well as his frustrations and appeals for action. Q: What is your response to the crisis in Myanmar and what is the Geneva Centre doing to help end the crisis? I have sent, to all members of the UN Human Rights Council (UNHRC), a letter appealing to them to organize a special session on the desperate situation of the Rohingyas that have been pushed back from Myanmar into Bangladesh. I have not received one single answer. About 650,000 people have been pushed out mercilessly—all of their property has been burned or destroyed, many have disappeared in large numbers, women have been raped, children have been killed—and nothing happens. I know in terms of politics there are all sorts of elements that need to be taken into account, but there comes a time when a situation of a violation of human rights exceeds certain proportion, whatever the politics, we should speak up. Otherwise it shows that, in the UNHRC, politics have definitely taken precedence over values and this would be the beginning of the end of this Council. It would be enough to have 16 states taking the initiative for a special session to take place. Can’t we find, in the whole of the membership, a few others that claim they are sensitive to human rights to respond and take this initiative? In 2007, the UNHRC held a special session on Myanmar because there were some peaceful demonstrations that had been exposed to violent responses by the military. The situation today is 100 times worse, so I cannot imagine why there isn’t a similar reaction. Q: Do the atrocities in Myanmar amount to crimes against humanity or even genocide? I am not qualified to say but I believe that some more qualified than myself have talked at least about ethnic cleansing. It is a case of ethnic cleansing but no one has responded to my appeal for a special session which would in fact have had a dual purpose—first, to impose, under UN control, a return of these people that have been brutally thrown out of a country in which they were born and lived for generations and secondly, to come to the help of Bangladesh which is one of the poorest countries that finds it difficult to face these financial consequences of the mass arrival of refugees. We therefore have a double moral obligation. The lives of all 650,000 people who have lost their homes—doesn’t that justify just a one-day special session when we have special sessions about every other country, every other crisis in the world? I do not understand that. My multilateral faith in human rights is being undermined. Q: If such a special session were to happen, what are you hoping would result from that? A recognition of the right of the Rohingyas to go back to their land, including a recognition of their status of citizens. I am aware that this [crisis] is the consequence to a great extent of British colonizers who would take some labor from what was then India and bring them over to Myanmar to work. The source of the problem goes back centuries but you can’t redo history. These people have been there for generations, sometimes hundreds of years. There must be a proper law that gives them the right to citizenship—citizenship should not be based on race. Bangladesh should also be given compensation and people or victims themselves must be given compensation for what they have undergone. It is true that there has been a group of violent protestors that have carried out some unacceptable violent actions like attacking police stations and we would not condone these actions. But let us have a commission of inquiry that looks into all the issues and submit an official report, including to determine the nature of the crimes in this awful situation. Q: If the crisis continues, should the international community take more drastic measures? Some are pushing for an arms embargo or targeted financial sanctions, what are your thoughts on that? I have always been hesitant about sanctions. Myanmar was exposed to sanctions and then the sanctions were removed. Neither did they improve their performance when the sanctions were on nor obviously since the sanctions have been removed and it has now become even worse. So for me, this is not a question of just sanctions. It is a grave issue—I understand the Secretary-General raised the issue four times in the Security Council (UNSC)—and I hope that the international community and UN system can join forces in addressing every aspect of this situation. But the UNHRC not having a special session on this now is a disgrace. Q: What is your response to the current divisions within the Security Council on the crisis as both Russia and China cite issues of sovereignty and ask to exercise “patience”? This is why I say: I understand the politics behind these issues but I do feel that the situation has reached such a peak that there must be action. The UNSC provides the politics, and the UNHRC provides the ethics. But where are the ethics now? 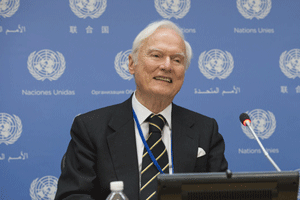 Idriss Jazairy is the former Algerian Ambassador and has long worked with the UN and other organizations. Among other high-level positions, he has been the President of UN agency IFAD and the Chief Executive of a consortium of international organizations ACORD. In 2015, Jazairy was appointed by the Human Rights Council as the first Special Rapporteur on the negative impact of unilateral coercive measures on the enjoyment of human rights. A ministerial-level pledging conference is set to be held in Geneva on 23 October to help meet the most urgent needs of Rohingya refugees in Bangladesh.